The shelf for a shelf rack is galvanised and has a chipboard beam. 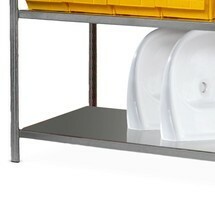 It has a shelf load of up to 190 kg and can be installed quickly thanks to the boltless system. 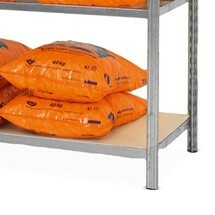 The galvanised shelves are resistant to corrosion. 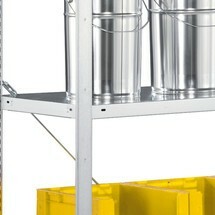 This additional shelf for shelf racks is galvanised and equipped with steel plate decks. Thanks to straightforward assembly, you can quickly expand and convert your boltless shelving system with this shelf. 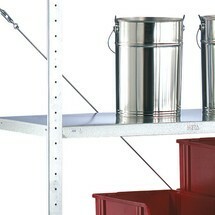 The shelf for the META shelf rack, boltless, is galvanised and has a shelf load of up to 80 kg. The rack shelf is manufactured out of high-quality steel plate with an M-shaped longitudinal channel and 5-point safety edge, making it very dimensionally stable. This galvanised shelf for a META boltless system for a shelf load of up to 100 kg enables you to store light and medium-weight goods. It is manufactured for high dimensional stability out of high-quality steel plate with M-shaped longitudinal channel and 5-point safety edge. This light grey shelf for a META boltless system for a shelf load of up to 100 kg enables you to store light and medium-weight goods. It is manufactured for high dimensional stability out of high-quality steel plate with M-shaped longitudinal channel and 5-point safety edge.